The esperanza (yellow bells), a Texas native and a 1999 Texas Superstar, will be featured at Saturday’s plant sale. It requires full sun to produce blooms from spring to fall, and can be grown in containers, flowerbeds or xeriscape areas. Also expect the orange blossom (orange jubilee) variety, which is a bit less common. Another new item is wildflower seed balls. 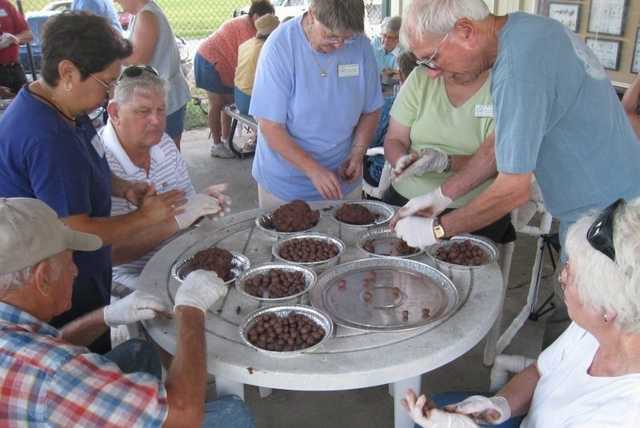 Handmade by Master Gardeners, wildflower seeds have been rolled into clay resulting in marble-sized clay balls. When dispersed in your garden or landscape rain will plant the seeds that are within the clay balls. Fall is just around the corner, and we welcome the cool weather after a very hot, dry and humid summer. Fall is an excellent time of the year to plant that shrub or tree to establish its root system in preparation for the hot summer months next year. So, grab a cup of coffee and walk around the yard. By now you’re already gathering ideas for changes that can be done to your existing flowerbed. Whatever the reason, you could use some new plants. Maybe you want to start one to attract butterflies, hummingbirds or just to have a garden to admire. Maybe you need plants for a container you just bought, a few vegetables for the table, herbs for culinary use or mint for tea – all reasons to attend the Master Gardener Fall Plant Sale. Victoria County Master Gardeners is holding the semi-annual plant sale Saturday, from 8 a.m. to 2 p.m., or until plants are sold out. The greenhouse committee has been busy propagating and maintaining the plants for the sale. We also have Master Gardeners who enjoy propagating at home and donate their plants to the sale. The event will be at the Victoria County 4-H Activity Center, 259 Bachelor Drive at the Victoria Regional Airport off U.S. Highway 59. There will be signs on Highway 59 with directions to the sale. If you’re not sure what can be grown in our area, take a trip to the Victoria Educational Gardens and get ideas. The gardens are located opposite the control tower at the airport. We have expanded our sales area and will have approximately 1,500 plants for sale. 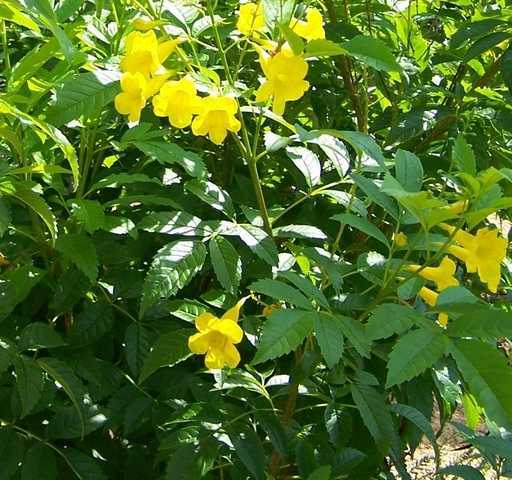 Our feature plant is the esperanza (yellow bells), a Texas native and a 1999 Superstar. It is a deciduous evergreen and we have several varieties ranging from 3-10 feet in height. It is known for its lightly fragrant, beautiful yellow tubular flower. A heat-loving, tropical plant that requires full sun to produce blooms from spring to fall, it can be grown in containers, flowerbeds or xeriscape areas. The removal of seedpods to promote blooming is recommended. Esperanza is insect free when planted outdoors, but in a greenhouse setting, aphids can be a problem. The esperanza (orange jubilee) that produces orange blossoms will also be available. “Texas Garden Almanac” by Dr. Doug Welsh, professor and extension horticulturist will be available at a one-day sale price of $22.50. This book is a month-by-month guide to all aspects of gardening from plants, soil, water, mulch, gardening designs, pests and plant care for the entire state. “Texas Garden Almanac” is a reference book every gardener or novice should have for all their garden needs. There will also be a new item featured, wildflower seed balls. These were handmade recently by members. They are marble-sized clay balls, with wildflower seed mixed into the clay before it dried. Just disperse and let the rain plant your wildflowers. This project is being coordinated to promote “Wildflowers across Texas.” The statewide kick-off for this program will be at 11 a.m. on Thursday, Sept. 11, at the airport Officer’s Club. It is a joint venture sponsored by Texas Department of Transportation and Texas Department of Agriculture in conjunction with the Texas Master Gardeners and Texas AgriLife Extension Service. Stop by the Painting Texas with Wildflowers table for more information. The DVD disk Gardening Publication Library Volume 2 by Texas AgriLife Extension will be available. It has 38 folders with more than 472 files of gardening information. Every disk will have an index sheet and a folder of the files will available for viewing at the table. We’ll also have koi and goldfish available from our own Master Gardener water garden. Come early before the sale to browse the various garden and landscape vendors’ tables. They have great items to decorate your garden. We will have staff at the information table and on the floor to answer any questions concerning plants. Holding tables will be available to keep plants for you until you are ready to check out, and if needed, our members will help with final carryout. Don’t miss this big plant sale. See you starting at 8 a.m. Saturday. The Gardeners’ Dirt is written by members of the Victoria County Master Gardener Association, an educational outreach of Texas Cooperative Extension-Victoria County. Mail your questions in care of the Advocate, P.O. Box 1518, Victoria, TX 77901; or vcmga@vicad.com, or comment on this column at www.VictoriaAdvocate.com. 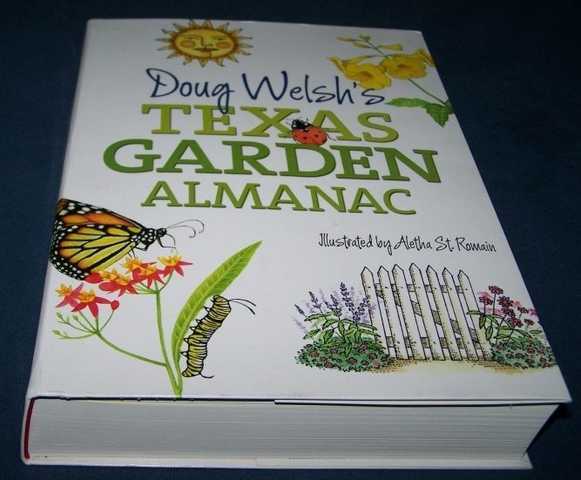 Available for the first time, and at a reduced price from the suggested retail price, is the new “Texas Garden Almanac,” by Dr. Doug Welsh, professor and horticulturist at Texas A&M University and former state coordinator of the Texas Master Gardener program. This book is a month-by-month guide to all aspects of gardening.